J.T., aged nineteen years, a Prussian sailor, whilst engaged in lowering, the trysail-mast, the rope supporting it gave way, and he was transfixed by its bolt, to the deck. 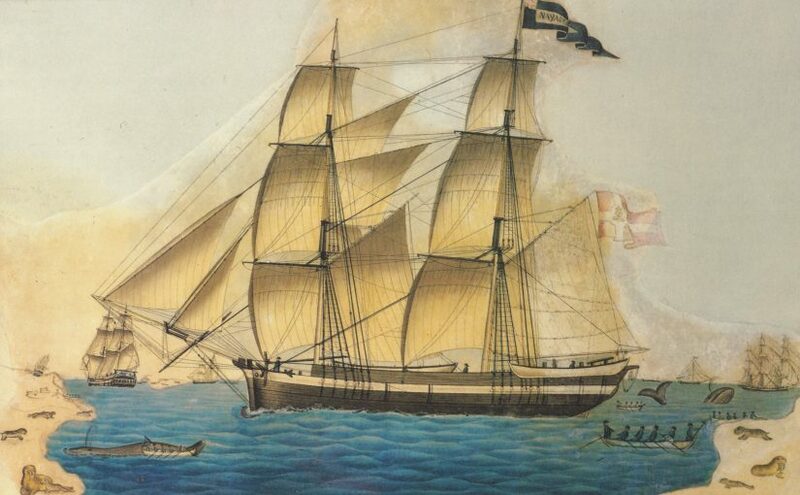 In nineteenth-century ships the trysail was a triangular or quadrilateral sail which was hoisted on a boom attached to the base of the mainmast (the ship in the image at the top of this page has two trysails, one behind each mast). In a footnote, Chelius explains that this ‘trysail-mast’ was 35 feet long and two feet in circumference. At its end was an iron bolt five inches long. At the time of the accident the mast had been lowered to within about six feet of the deck; the man raised his arms to lay hold of and guide the bolt into its proper place, when at the moment the suspending rope slipped or broke, and the mast dropping perpendicularly, fell on his chest. A 35-foot mast of oak or pine would have been a fearsomely heavy object. This one had a five-inch metal spike at its end. It knocked him down on his back, and the bolt passing through his chest, pinned him to the deck, which it penetrated to the depth of an inch, so that his chest must have been compressed, from before backwards, to a space not exceeding four inches. Four inches is about 10 cm. Try to visualise that: the sailor’s chest and its contents were crushed to a fraction of their usual depth. Some time elapsed before the bolt could be drawn out, and he was then carried to the hospital. Bolt removed from sailor’s chest. The right-hand part of the bolt passed through his ribcage, and embedded itself into the deck underneath him. Feb. 25, 1831: On his admission, 10, A.M., the countenance was livid, the breathing excessively distressed; small quantities of frothy blood were occasionally spat up, the pulse intermitting; and for some time after his admission, these symptoms increased, threatening almost immediate suffocation. The ‘frothy blood’ was an indication of bleeding within the lung, which had evidently been punctured by the iron bolt. It goes without saying that this was a life-threatening injury. The bolt had entered the chest, between the fourth and fifth ribs of the left side, about an inch and a half from the middle of the breast-bone, passed obliquely downwards and outwards, and came out between the eleventh and twelfth ribs, four inches from the left side of the spine. In addition to this hurt, the scalp on the right side was considerably lacerated, extending from the frontal to the lower part of the occipital bone, and exposing a great part of the temporal muscle. The lower jaw was also badly fractured. The head wound could be cleaned and bandaged, but in the 1830s there was virtually nothing a surgeon could do for such a serious chest injury, except wait and hope that it was survivable. A pledget of lint was applied over the wound, and fastened with adhesive straps, but nothing more was done, and two hours after his admission the more urgent symptoms of suffocation had subsided, and he rallied a little. The sailor passed a restless night, but to his doctors’ relief he was still alive the next morning. The therapeutic regime they adopted was orthodox for the time: it involved frequent bloodletting, laxatives to purge the bowels and a bland diet of milk, arrowroot and powdered biscuits. Opium was frequently administered to ease his pain. His recovery was slow, but a month after the accident he was reported to be doing well and living on blancmange and coffee. By the end of April he was also ‘allowed table-beer and half a chicken daily’, which sounds rather more appetising. On May 25th – some three months after the accident – he was finally convalescent, and well enough to leave hospital. The amount of blood (slightly more than four pints) taken directly from his veins is nothing too dramatic over the course of three months, but 300 leeches must have added considerably to this total. Ten years after the accident Mr Guthrie was invited to examine the patient for himself. He was in good health; the breathing of the side injured [was] good; the action of the heart violent, but not irregular. The depression made by the bolt and its cicatrix [scar] was so directly over the great vessels, that it must have passed between them, pushing them aside, constituting altogether one of the most remarkable cases on record. Now that really is extraordinary. The ‘great vessels’ are the aorta and pulmonary artery, which are so closely entwined just above the heart that it’s barely possible to get a cigarette paper between them, let alone a metal bolt. The illustration below gives you some idea of just how unlikely this is. It was owing perhaps to the end of the bolt being blunt, and the great force, from the weight of the yard with which it was driven through, that the lung was but little injured. Guthrie’s suggestion seems quite sensible. His point is that when the human body is impaled, a blunt object sometimes does less damage than a sharp one, because rather than pierce the internal organs it simply pushes them aside. Guthrie was speaking from experience – and indeed he goes on to cite the similar case of Thomas Tipple, previously dealt with on this blog. But what of the man’s later career? After being pinned to the deck of a ship you think he might have tried something less dangerous; but not a bit of it. He recovered his health perfectly; first went into service as a footman, but returned to the sea, and was twice shipwrecked, and saved his life by swimming a considerable distance. In 1841 he was well, and went on a voyage to the West Indies.